Giveaways are by far the most popular type of interactive marketing campaigns ShortStack users run. It’s a common scenario for brands to get hundreds of thousands of views and collect tens of thousands of entries and email leads from their campaigns. But a recent Mother’s Day contest, hosted by a small midwestern radio station, got so much attention you’d think they were Los Angeles-based and giving away a meet-and-greet with Taylor Swift. Instead KCLD-104.7, based in St. Cloud, Minnesota (population 67,641), was giving away a spa day for a mother-daughter duo. A nice prize, for sure, but the results were way beyond what they imagined: During the 30 days the contest ran, the “Win a Mother/Daughter Spa Day” contest had 24 million views and more than 200,000 entries. In this case study, we’ll explore what the station’s parent company’s goals were and what Leighton Broadcasting did to meet them. When KCLD-104.7 launched their contest, they were looking for ways to engage their listeners. “The primary goal was to provide engaging interactive content for our listeners and communicate with them on multiple platforms,” says Kelli Frieler, Leighton Broadcasting’s Executive Director of Digital. Our team thought a contest would help them interact with their loyal audience while also growing their Facebook fan base, which now has more than 146,000 followers. 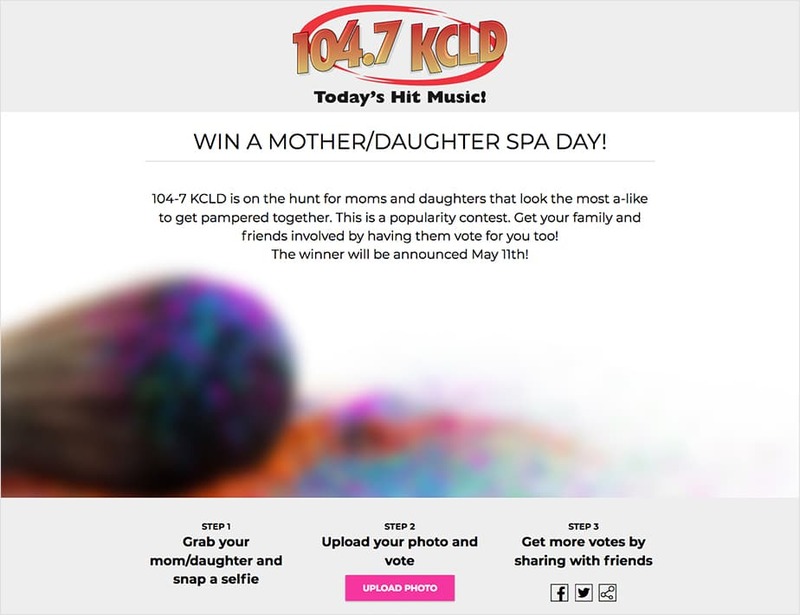 KCLD-104.7 created a user-generated photo-vote campaign. 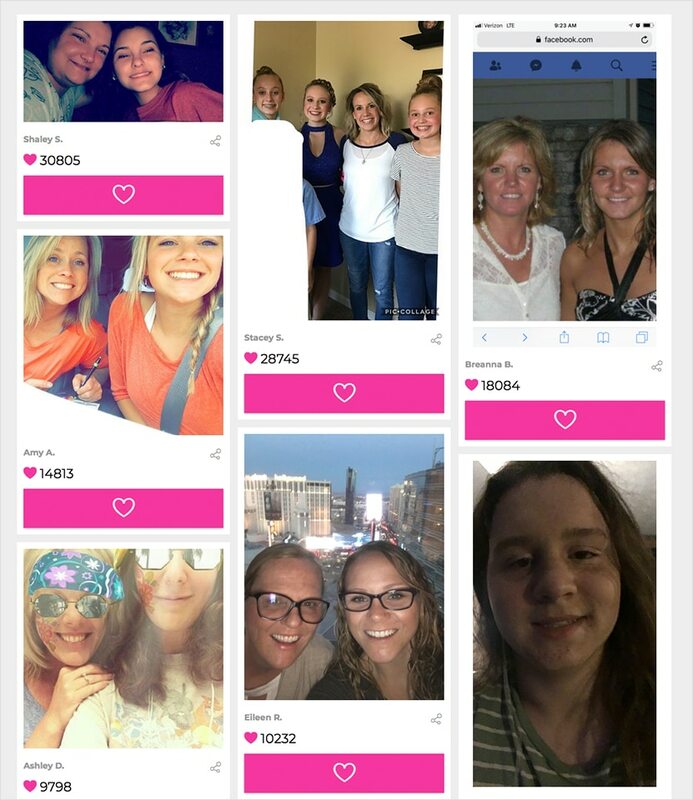 They asked people to post mother-daughter selfies and share their entry to collect votes. “Within a few days we had gotten thousands of entries,” says Frieler. “Even though the prize was relatively expensive, people loved being able to share their photos and express themselves,” she says. “Any time you give people the chance to express love, gratitude or thanks, it’s a ticket to engagement,” she adds. The top vote-getter had more than 30,000 votes. Leighton Broadcasting had been working to create more content for use throughout the year. “This content provides us with a chance to really connect with listeners, while also providing our clients with an opportunity to associate their brand with a unique engagement and brand extension,” says Frieler. Frieler says there were several ShortStack features that played a key role in the campaign’s success. “The voting and sharing features were key,” she says.